The beautifully arched headboard and footboard feature bold, thick slats that make this Mission Style Bed an elegant centerpiece for any bedroom. Handcrafted by skilled Amish woodworkers, here in the United States, the Amish Country Style Mission Bed is built for the long haul. 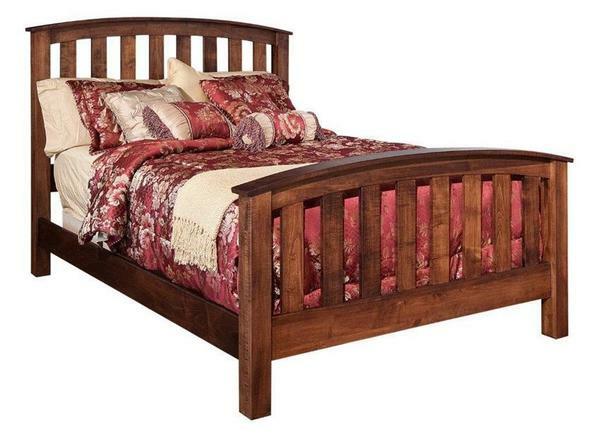 Each piece of hardwood is hand-selected to ensure the strength and beauty of your bed and construct an heirloom quality piece that will be handed down for generations! Available in a variety of hardwood and stain combinations, you're sure to find the perfect Country Style Mission Bed to fit in with your decor. Please call one of our Amish Furniture Specialists today to answer your questions and start your order over the phone. Toll-Free (866) 272-6773. King: 82 3/4" x 89"
Queen: 66 3/4" x 89"
Full: 60 3/4" x 85"
The standard construction of this bed requires a mattress and box spring, unless under-bed storage is added. As an option, you can have this bed constructed with a platform above the slat system to be used with a mattress only, without adding under-bed storage in the options menu.